A University of Central Florida chemistry professor’s low-tech process for breaking down raw materials into sugar may be the linchpin for making low cost biofuels. Thor Renewable Energy Inc. has secured an exclusive license to the technology and plans to expand its commercial-scale biofuel production facilities to Florida’s Space Coast later this year. Richard Blair, assistant professor of chemistry and forensic science at UCF, and a biofuels specialist, uses a milling process to convert raw materials to simple sugars and other useful compounds. He was initially exposed to the general technique while working at NASA’s Jet Propulsion Laboratory (JPL). Blair’s process uses a rotating drum to grind raw materials and, in a twist, uses a natural and inexpensive catalyst to convert cellulose into simple sugars. Most techniques used today rely on sulfuric acid to spark the conversion process, resulting in hazardous byproducts that must be reprocessed prior to disposal. “The ball mill converts biomass immediately to a sellable product. 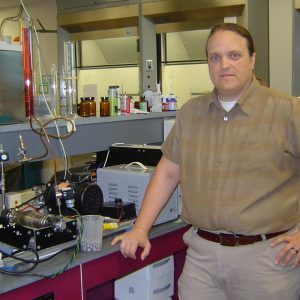 It is inherently green and easily scalable: this is unique because many lab processes are not green or easily scalable,” Blair said. Many biofuel production systems use sugars as the raw materials. The availability of sugar is often limited by crop performance: if crop yields are low, or if crops fail, then biofuels facilities – such as ethanol plants – do not have the sugar feedstock needed to create biofuel. Blair thought that the ball mill had potential for biofuel production because it will convert any type of biomass – from yard waste to scrub brush – into sugar and it doesn’t leave behind problematic by-products. For Thor this could eliminate the problem of having to compete with food supplies such as corn and soybeans, for raw materials or feedstock. Cox learned of the UCF technology at the Space Coast Energy Symposium sponsored by the Florida Cleantech Acceleration Network in February. Thor plans to scale-up and incorporate UCF’s technology as part of its future commercial-scale biofuels production facilities, including a likely expansion in Brevard County later this year. The company will use the technology to produce clean fuels that offer higher horsepower and lower emissions. Thor’s commercial plants could create over 50 jobs, and is currently working with Brevard County’s Economic Development Commission, the State’s TRDA, and other State agencies as it considers possible expansion opportunities in Florida. Headquartered in Singapore, Thor also has activities in Latin America and the Philippines. This is an amazing development! The Voyage Institute is a 501C3 Bioscience and Biotechnology Education Institution, in the process of establishing a BioBus, a mobile science research and learning lab. We would love to integrate this concept into our bus. We are located in Central Florida, so let's talk about the possibilities.